Where there is a mixture of air and a flammable substance (such as a gas, vapour, mist or dust), then there is the potential for an explosion to occur. All the mixture requires is a source of ignition. Where equipment has to operate in such atmospheres, then clearly it is crucial to ensure that the equipment does not provide the source of ignition. For equipment being placed on the UK and European market, this will come under the European Directive for ‘Equipment and Protective Systems Intended to be used in Potentially Explosive Atmospheres’ (or more commonly known as the ATEX Directive). The ATEX Directive (2014/34/EU) came into force on the 20th April 2016, replacing 94/9/EC, applies to equipment and protective systems for use in potentially explosive atmospheres on the surface, below ground and on fixed offshore installations. The ‘equipment’ can be electrical and/or mechanical, as long as it is capable of causing an explosion through their own potential source of ignition. The Directive can also be applied to components too. The now superseded Directive (94/9/EC) came into force on the 1st March 1996 (with a transitional period up to 1st July 2003) and now any new Declarations being made to the ATEX Directive should quote 2014/34/EU from the 20th April 2016 onwards). A unique aspect of the ATEX Directive is the ties it has with the user legislation. The Directive requires the manufacturer to design their equipment to be suitable for use within their customer’s explosive atmosphere. Therefore they need to rely upon their customer to give them information about the classification of the zone and the flammable substance(s) within that zone. This is where the user legislation comes in handy, as it will put the responsibility upon the end user to only source and use appropriate equipment within their potentially explosive zones. In the UK this user legislation is called DSEAR. 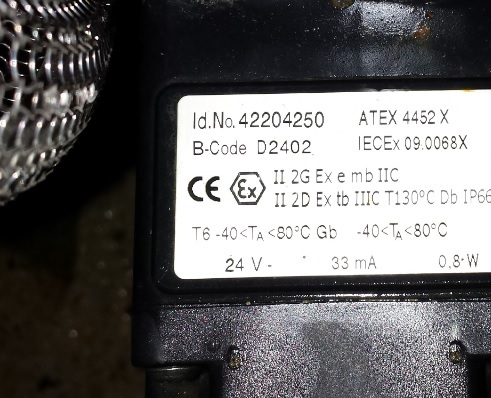 The only responsibility the manufacturer has is to ensure that the equipment complies with the product legislation, this being the ATEX Directive (and any others that may also apply). Equipment covered by Article 223 (1)(b) of the Treaty (arms, munition and war materials). The route to conformity is based upon the category of the equipment and also whether it is mechanical and/or electrical. The first stage is to understand whether the equipment is intended to be used underground in a mine or whether it is above ground. For mines there are two categories M1 and M2, and for above ground there are three categories (1, 2 & 3) depending upon the zone. 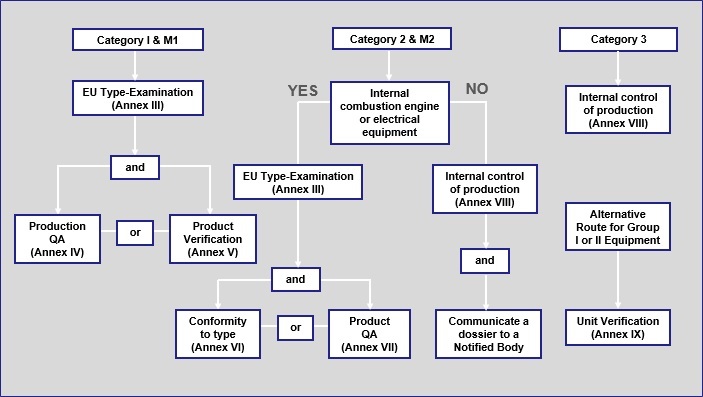 The ‘Internal Control of Production’ procedure is a self-declaration route that does not require the involvement of a third party or a Notified Body for CE Marking. All of the other conformity procedures require the manufacturer to appoint a Notified Body. The full requirements of the conformity procedures are explained within the Annexes of the Directive. – The New ATEX Directive – What are the changes? For more support on CE Marking under the ATEX Directive, or to find out how we can help you, please call us on 01564 792349, or please complete our online enquiry form.